Making strategic investments in both people and real estate to create communities of choice. Learn more about the Neighborhood Lift program! NeighborhoodLIFT is now available in Birmingham area! NeighborhoodLIFT is a national down payment assistance program sponsored by Wells Fargo and NeighborWorks America. It provides eligible homebuyers with matching funds up to $7,500 to use toward down payment and closing costs on qualified homes. Interested? Neighborhood Housing Services of Birmingham, Inc. (NHSB) was chartered in 1970 with a mission to stabilize urban neighborhoods in the city of Birmingham by offering programs and services that empower individuals to overcome their present and upcoming financial challenges. For nearly 40 years, Neighborhood Housing Services of Birmingham, Inc. (NHSB) has worked to give families the tools they need to emerge from poverty and achieve financial stability. Our goal is to help stabilize urban neighborhoods in the City of Birmingham and surrounding areas by promoting personal financial empowerment and homeownership. 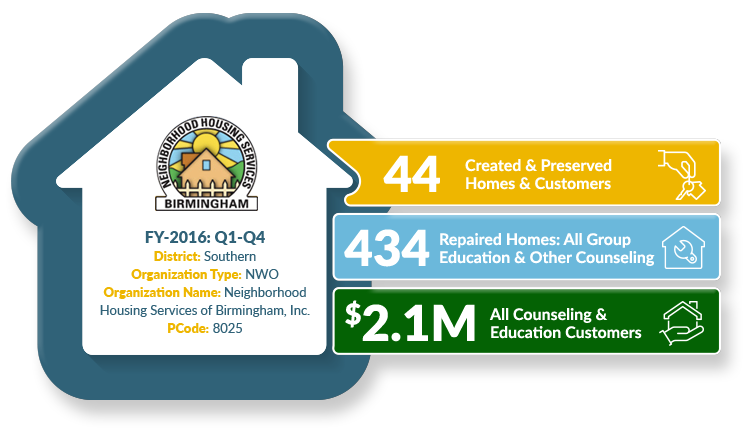 Stay up-to-date with news and information from Neighborhood Housing Services of Birmingham. Public response to the City of Birmingham’s “100 Homes, 100 Days” initiative has been tremendous since it was announced two weeks ago. The city of Birmingham, Wells Fargo and NeighborWorks America are partnering to give some homebuyers down payment assistance grants between $2,500 and $7,500.